Why Do I Experience Lumbar Spine Pain? Various structures in your lumbar spine can result in pain, which is described as an agitation towards the spine’s nerve roots resulting in severe joint and spine problems. The disc, muscles and bones can all become the source of pain during lumbar spine pain. It is a serious condition which may be caused by some serious underlying conditions and need to be identified and treated promptly. Continue reading to get detailed information on lumbar spine and the lumbar spine pain. Lumbar refers to your torso’s abdominal segment that is positioned between the pelvis and diaphragm. The term ‘lumbar region’ is at times used for referring to your lower spine and the surrounding area. 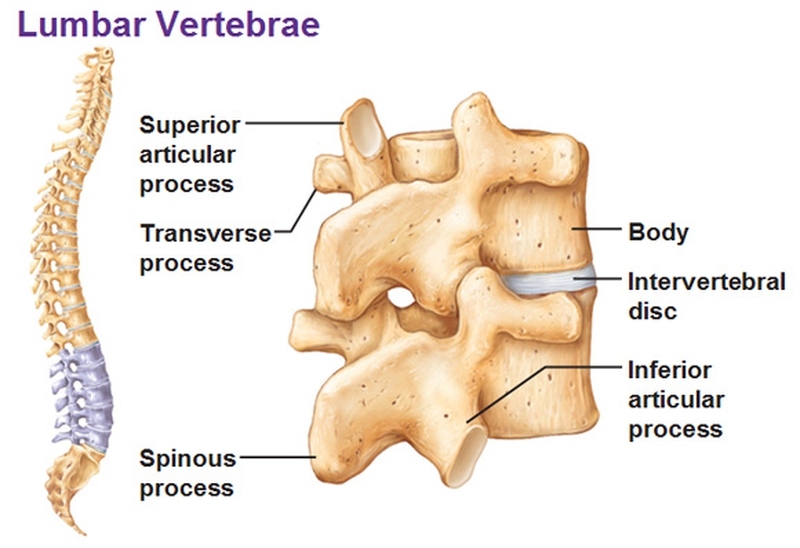 The strongest and largest vertebrae in the back are the five that are located in the lumbar portion. They are distinguished due to the foramen’s absence in the transverse process. There is a nerve root between every vertebra of the lumbar. These roots join together for forming the sciatic nerve, which is the biggest nerve in your body. It runs into your feet via your legs. Disorders that affect the nerve root can result in terrible pain that moves down the main sciatic nerve. The lumbar area bears most of your body weight; it provides you with flexibility and helps you move properly. However, it is prone to injuries, which is why the lumbar spine pain is a common problem. Lumbar spinal stenosis refers to the contraction and tapering of your spinal canal which takes place in the lumbar region of the spine. People suffering from this condition aren’t able to walk properly or for longer time periods. Mostly, this problem occurs due to the wear and tear of the lumbar spine, which does take place with the passing age and time. People with progressive degenerative disease, also known as arthritis are more prone to lumbar spinal stenosis. When the spinal canal narrows, it squashes the nerves that results in tingling, weakness, numbness and pain in your legs, buttocks and lower back, especially after you carry out any physical activity or walk for long periods. These symptoms decrease in intensity when you sit, lie down, lean forward or bend. However, they return when you begin walking again. Muscle strain due to bending, heavy lifting or any other repetitive or arduous activity can result in a terrible pain in the muscles. Though muscle strains normally get better within a couple of days or at times weeks, but this problem tends to return and is one of the common causes of lumbar spine pain. An invertebral disc is a spongy pad between every vertebrae of your lumbar spine. It absorbs shocks and keeps your lumbar safe. However, if the discs degenerate, they can result in an excruciating pain in that region. This condition is normally known as degenerative disc disease. Lumbar spine problems often occur due to herniated discs. Disc herniation can take place abruptly due to heavy lifting or injuries or can occur slowly due to routine deterioration of the lumbar. Sciatica is a common sign of this condition. Osteoarthritis affecting your lumbar spine is also known as ‘facet joint arthritis.’ Wear and tear and aging have a negative effect on the cartilage that covers the joints of the spine’s back, making it frayed and worn out. Excessive friction can result in joint swelling and bone spurs that limit your movement and cause tenderness. The tailbone’s top and lumbar’s bottom are connected together via the sacroiliac joint. If any dysfunction takes place in this joint that either restricts routine movement or allows extra movement, then it can result in sciatica pain or lumbar spine pain. Spondylolisthesis takes place when a vertebra slips over the vertebra lying beneath it. Normally, this slip takes place in the vertebra of your lower lumbar. In case, the nerve root is compressed by the vertebra that has been slipped, you can suffer from foot and leg pain. Resting for a few days enables the nerve roots and injured tissue to heal. This consequently relieves the lumbar spine pain. However, resting for a long time weakens the muscles that in turn aggravates the condition. Heat therapy or ice packs can help in relieving the painful lumbar spine pain as they reduce inflammation in the spine. Both these therapies can be used for soothing the lumbar. Numerous prescription and over-the-counter medicines are available for reducing the lumbar spine pain. Most of these medications decrease the inflammation and some prevent the pain signals and stimuli from getting to the brain. Every medicine has pros and cons, so you need to use it after consulting with your doctor. Exercising properly is crucial for alleviating lumbar spine pain. Take the help of an experienced chiropractor, physiatrist, physical therapist or doctor to choose a suitable exercise program for you, which should include aerobic conditioning, strengthening and stretching. Low impact aerobic exercises like walking, water exercise and swimming are great for promoting a healthy lumbar. These injections administer steroids right into the area suffering from pain and reduce inflammation in that region. They do not completely heal the pain, but offer relief to the patients so they can move and exercise to heal their lumbar spine. Surgery is mostly resorted to at the end when none of the other treatment options are able to benefit the patient. Microdisectomy and laminectomy are known to be helpful in treating sciatica. Fusion surgery is an extensive surgery and is used for stopping motion at any motion segment. Always consult your doctor with these options prior to exercising them. Server responsed at: 04/23/2019 8:28 p.m.